How does entrepreneurship affect city economic growth? What role does entrepreneurship play in increasing economic mobility? kinds of new ideas. As Jane Jacobs famously observed decades ago, a core strength of cities is their tendency to juxtapose juxtaposition different people and firms in a way that stimulates the formation of new ideas. Physical proximity, the built environment, institutional characteristics and social norms found within cities influence this process of idea creation. sew a shirt, is the driving force behind long-term economic growth . Far from being random, the knowledge creation process hinges on the density of interaction in cities to generate new ideas. Cities mix different people together, and the resulting interactions are a fertile ground for the creation of all kinds of new work. As Jane Jacobs observed, this process of creating new work helps drive economic growth, not just in the city, but in the larger world as well. to measure, but one good indicator is the location of patents. Patent data show that, far from being a flat world, the geography of new idea generation is highly concentrated in a few cities around the world. In the United States, our key assets for creating new ideas are highly concentrated, especially in larger cities. As the Brookings Institution has documented, the 100 largest cities account for 78 percent of patents issued, 81 percent of research and development jobs and 94 percent of all venture capital investments. a city enables small firms located in cities to tap the same kind of resources. The resources afforded to firms by city locations substitute for the same capacities that larger firms have to create internally. Similarly, the line between entrepreneurs and customers in innovation is increasingly blurred in cities. The depth and diversity of customers in cities is attractive and advantageous to entrepreneurs because as Eric von Hippel has observed, many important innovations are the result of user modifications and close interactions between producers and consumers. Cities are places that toss different people and ideas together in ways that generate new work and new firms. This process is at work in many urban economies and in many different industries. Its influence is not the exclusive province of so-called creative sectors of the economy (though they may be more prolific and obvious). Cities are good places for consumers to try new things, which make them good places for entrepreneurs to try new ideas and start new businesses. Cities are great places for entrepreneurs, and entrepreneurship is a key factor in city growth. 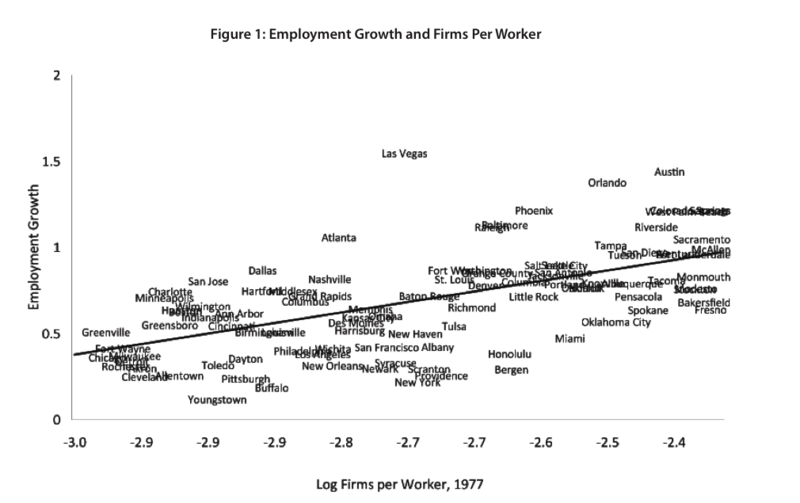 The number of small firms in an industry is strongly correlated to later employment growth in that industry in that city. Studies by Ed Glaeser and his colleagues show that a city’s level of self-employment in 1970 predicted growth in population and income over the next three decades. For many industries, entrepreneurship is a highly localized process. Even within cities, entrepreneurship varies by neighborhood. Localization economies are important. Other studies show that new firms in an industry tend to be born close to existing firms in the same industry, and the effect of an industry concentration declines sharply with distance. Fast growing, entrepreneurial firms may be particularly important for providing opportunities for upward mobility because they tend to hire more younger workers (Ouimet & Zarutskie, 2013). Having a large number of young, small, entrepreneurial firms may create more opportunities for young workers from all economic strata to progress through the economic spectrum.